I cant help but dream of spring. I am going crazy shopping for all things corally, minty, and muted. 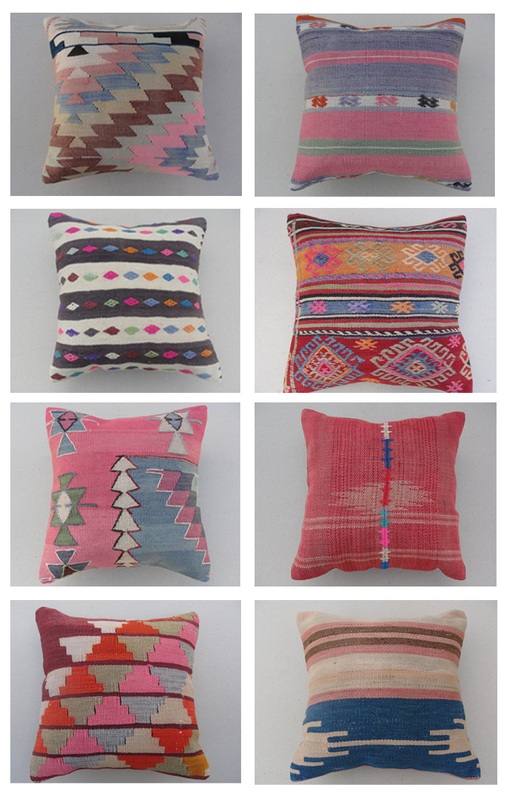 The shoppe is getting its fair share of pretty new pillows that I thought I would give you a glimpse of. I come home tomorrow. This trip has been very very stressful and sad, however I am ready to come home and start fresh. I have some really exciting things in the works for 2013 and I am ready as ever to get the ball rolling. P.S the new website/blog is almost complete!!!! Is this pillow on bottom right still for sale? That's lovely pillows. :) The price $98.00 is for all 8 of them or only for 1 pillow?? Wonderful patterns on those and love the muted hues. We're presently designing a bedroom around a Navajo rug that was part of Grandmom's collection. We'll remember Grandmom and everything she stood up for at the start of every day. It's never easy to say goodbye to someone who has been such a huge part of your identity (or your spouse's). Here's hoping February 5 is the beginning of a glorious 2013 for you. And now we're popping over to your store! A rather significant error here, I am afraid: I suppose we should finally accept that spring is coming doesn't work. Very likely. Would like to have those cuddly and colorful pillows. awesome! It's true haven't seen you put much painting up here in a while, but really good. Vivid colored pillows, love to have them in my bedroom or sofa. Your post is really helpful for Home design & Construction.I am finding this kind of helpful real estate blog and content .I have found some important info and helpful tips from commercial builders brisbane blog and their info was really fantastic.But you have posted nice so please keep it up . A home can never have enough throw pillows. They are so playful and really bring the couch out of its dormant state. I think that these would go so well with the theme I have right now. beautiful pillows its all looking pretty with different colors. Write great post . That’s Interesting blog . These are lovely pillows. Thank you for sharing it. "interior design college in Indore for its different interior designing courses, unique training methodology, huge & beautiful campus and presence of nationally acclaimed interior design industry professionals as mentor, guide & faculty.